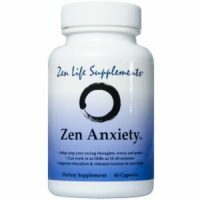 This review of Zen Anxiety examines this product in more depth. 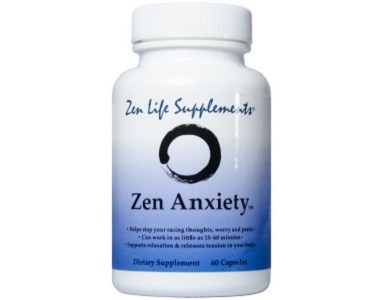 This anxiety relief supplement is manufactured by Zen Life Supplements. The manufacturer claims that this product can provide relief from fear and anxiety, by calming the mind using natural ingredients. The manufacturer claims that the product can supplement dopamine and serotonin levels, thereby making the user feel better, and happier, aiding overall well-being. Continue reading this review for more about this product. This product contains some clinically proven ingredients that help to decrease anxiety. The ingredients improve the sense of relaxation and calmness. Our research found, however, that this product’s formula lacks vital ingredients, such as 5-HTP, valerian root, passion flower, chamomile, or even bacopa. Furthermore, this product lacks an added night formula containing melatonin that promotes peaceful sleep. A separate nighttime anxiety formula would have helped aid sleep, balance sleep-wake cycle, regulate circadian rhythms and promote restful sleep. How Do You Use Zen Anxiety? The manufacturer of this health product recommends a daily dosage of two capsules. However, the manufacturer of this supplement does indicate that this dose may be increased to up to six capsules daily, when three doses are taken. This product is available direct from the manufacturer. On the manufacturer’s website, this product is advertised at $49.95 per bottle. However, two other package deals are offered: two bottles at a discounted price of $89.99 or the Total Zen Package consisting of five bottles for the 40% discounted price of $159.99. However, the manufacturer recommends taking up to six capsules per day. Each bottle contains 60 capsules: one bottle will only last for 10 days, thus three bottles would be needed per month. The manufacturer of this health product offers a 100% money-back guarantee on their first bottle if a consumer is not satisfied with this product. The manufacturer of this supplement product guarantees that the user will feel calm within 60 minutes of taking their first dose. However, on their bulk offer, only one bottle will be covered by this guarantee; the rest would lead to a loss. This anxiety relief supplement seems interesting, coming with a money-back guarantee. The manufacturer of this product offers discounts and package deals which would save the buyer money in the long run. On the downside, however, the guarantee covers only the first bottle purchased. In addition, this product, although containing some clinically proven ingredients, lacks most of the others that scientists have identified as effective. In addition, in terms of costs, if the user should follow the recommendation from the manufacturer of taking six capsules per day, a month’s supply will be pricey. This is a concern. Despite lacking most of the important clinically proven ingredients, the product is costly. Brought to you by the health experts at Consumer Health Review.